An antique Victorian gorgeous suit jacket that's made on a cream silk brocade over French lace with black velvet and gold lame' detail. It's gorgeous but it's in poor condition. 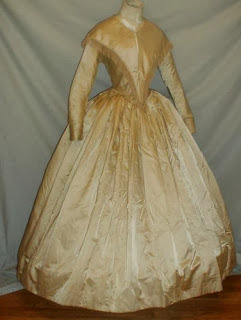 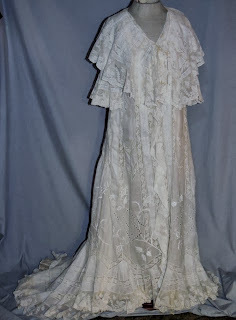 The foundation, the sleeves under the silk and the bone casings are in excellent antique condition. 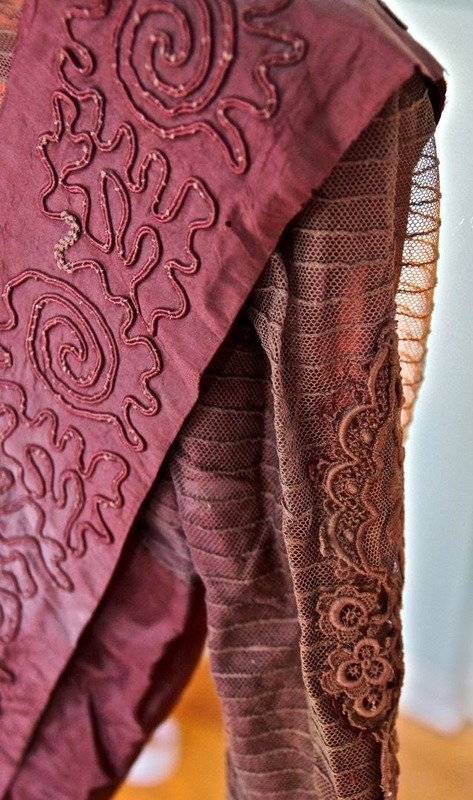 The silk brocade has wear and tears especially on one of the sleeves and there's some damage on the lace. 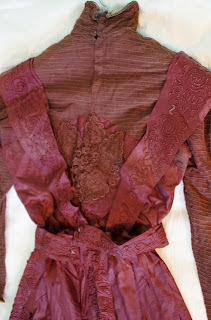 It would be great as a pattern I have several of these Victorian jackets that I'm listing this week that came out of the same Brown County estate. .
MEASUREMENTS ~ ~~ 17 1/2 to 19 1/2" length, 33" bust, 23 1/2" sleeve, 17" across the shoulders. 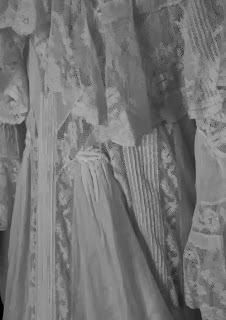 CONDITION ~ ~ See description above. 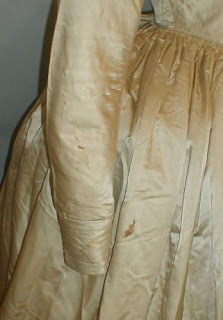 Poor condition. 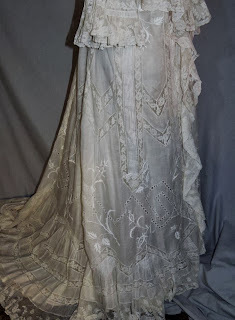 Turn of the Century look but love that print! This beautiful Victorian peignoir is made from a light weight cotton mull, trimmed with hand embroidery, insertion lace, pin tucks and wide ruffled lace. 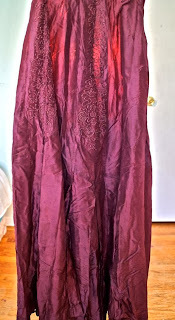 It opens in front to below the waist, then the center front seam is sewn closed, it has a button midway up the front, but needs a button or hook and eye at the neck. 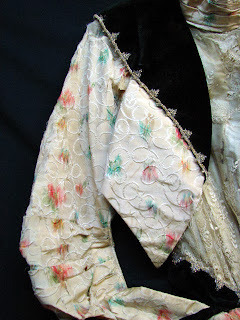 The sleeves have a huge flounce and a wide full collar, the back falls to a lovely train. 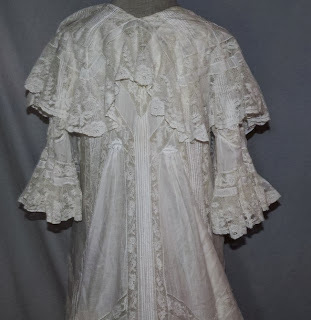 It's lined in ivory silk. 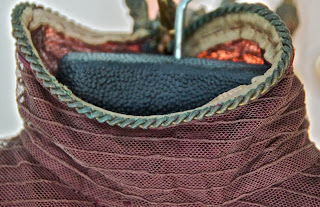 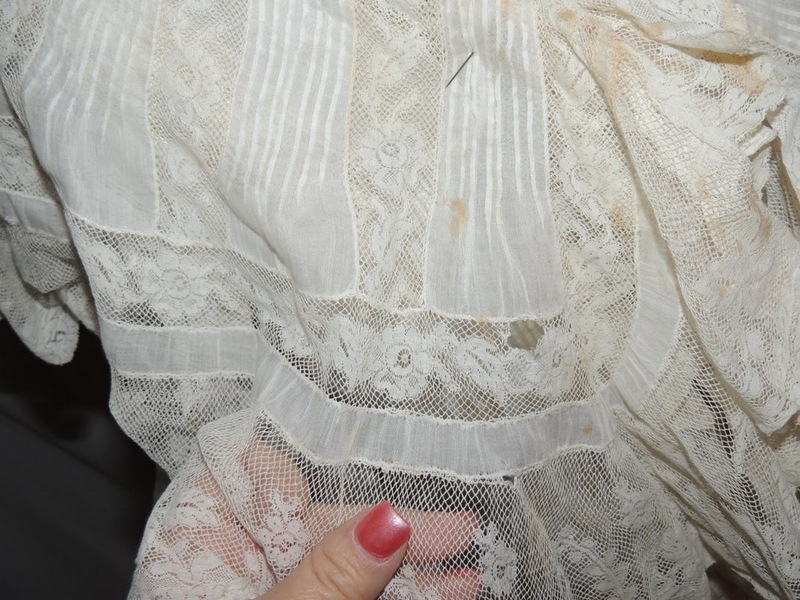 The silk has a few tears around the neck and some scattered holes toward the bottom, the cotton has some light stains on the collar, 2 pin head holes in the cotton, a few opened seams and a few small breaks in the lace, but overall good and restorable, spots should easily soak out. 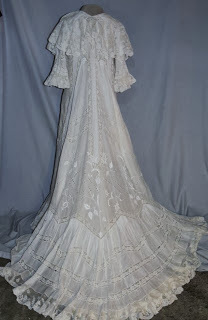 It measures 42 inches around the bust, waist is 39, hips are 54 (measuring the lining, the robe is larger), across the back shoulder is 11 1/4 inches (most restrictive measuresment) and it's 55 1/2 inches long in front. 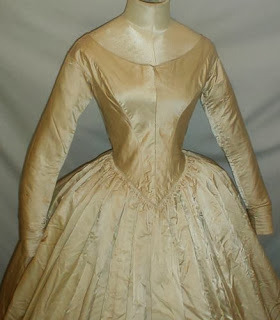 OVerall excellent condition, minor restorations and very wearable. The high waistline (you can see it in the back of the robe) and the shape of the sleeves means this is probably 1900's - around 1908. In this auction we are offering a lovely silk bodice dating from the late 18th or early 19th century. This piece is of course entirely hand sewn. 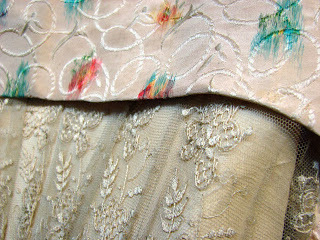 It is constructed from iridescent pink silk and is lined with in a coarse, off white linen. At a later date, probably around 1900, someone added hooks and eyes; you can see the marks made by the straight pins that were originally used for closure. 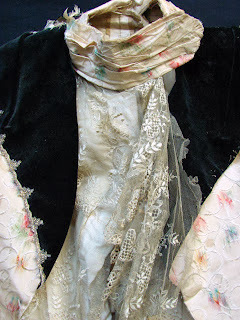 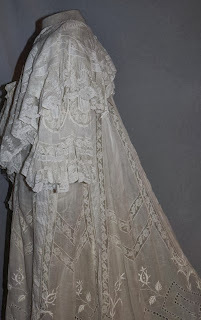 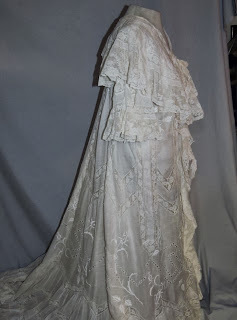 I believe that the lace that is tacked onto the sleeves and collar was also added about this time; this could easily be removed to restore it to the original form if the new owner desired to do so. 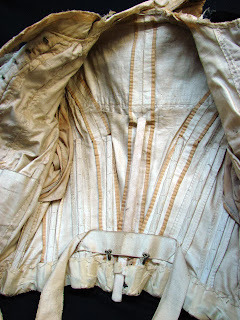 The condition of this garment is very good to excellent. The silk and the linen are both solid and flexible with no evidence of splitting. 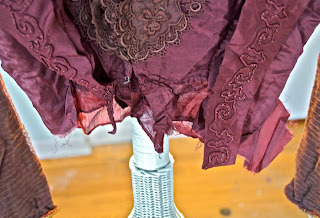 There are some light perspiration stains to the underarm areas but again, no splitting. 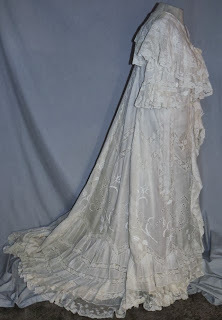 A great piece for study or display, would look great in a shadow box. 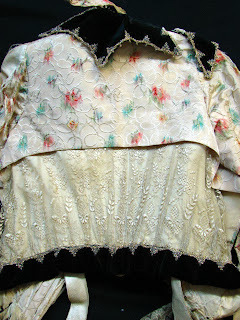 Measures as follows: Bust 20, Waist 22, Front Length 9 and Back Length 11. 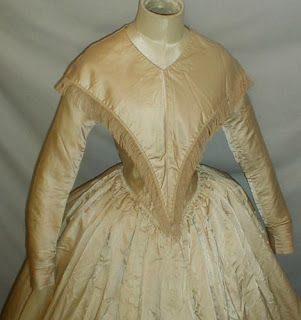 PLEASE NOTE: This garment is over 200 years old and Absolutely NO attempt should ever be made to wear it no matter how sturdy it looks. Therefore, the measurements are provided for reference purposes only. So the first thing that gives away that this isn't late 18th C is that weird back bow thing. 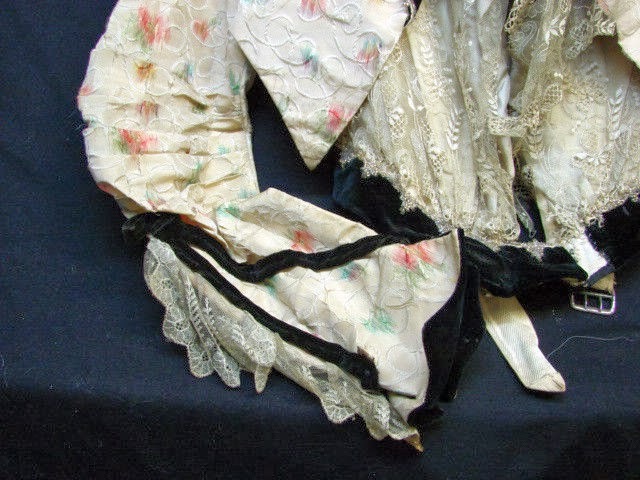 I have no idea what it is but it looks like a bow trying to act as late 18th C tails and failing. 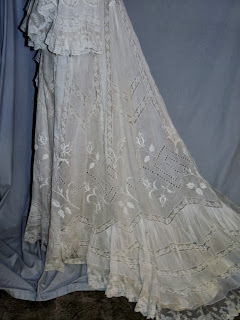 The second thing is the lace - very much mid to late 19th C in style. 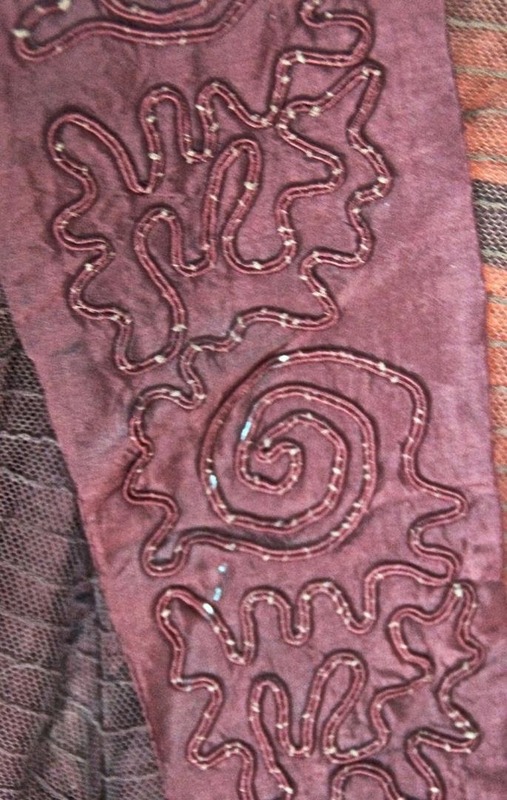 The biggest hint though is the machine stitching. Dead give away that you are dealing with something 1850's on. 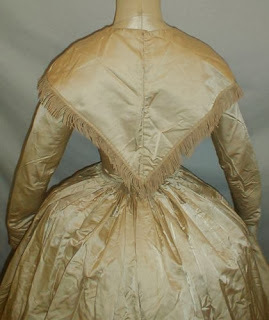 Yes, the shoulder strap construction looks 18th C and it *might* have been an 18th century bodice at some point but they did a number on it in the 1860's. 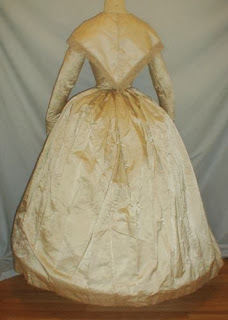 I say 1860's only because of how short it is - it could be as late as 1910's for fancy dress. Either way, it's not 18th Century. 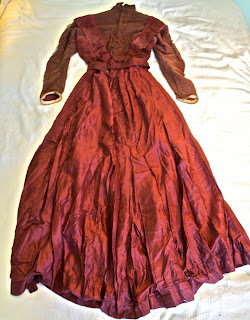 This deep red wedding dress from the 1880s has beautiful detail and with beautiful needle work and an elegant shape. The top has two layers of sheer fabric and the outer layer has delicate, expertly sewn pleats. 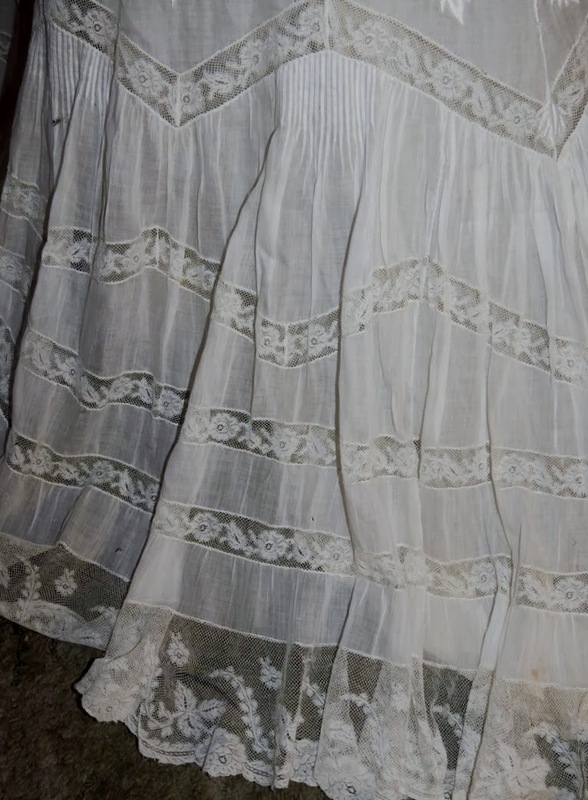 The sheer fabric is found on the upper back and front, the high collar and the long, slim sleeves. The top of the collar and the edge of the bottom of the sleeves. The sheer fabric is undamaged. 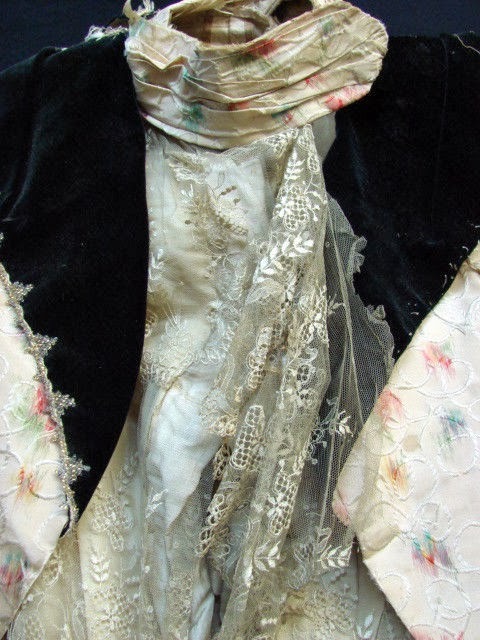 At the front and back below there is exquisite lace. 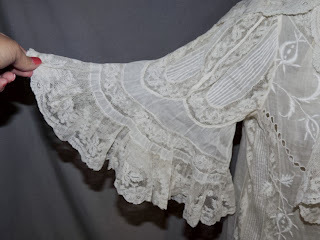 The same lace is appliqued on the exterior upper section of the sleeves. 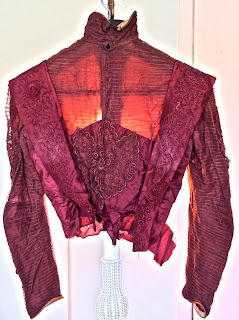 The back of the top is fastened by hooks and eyes. 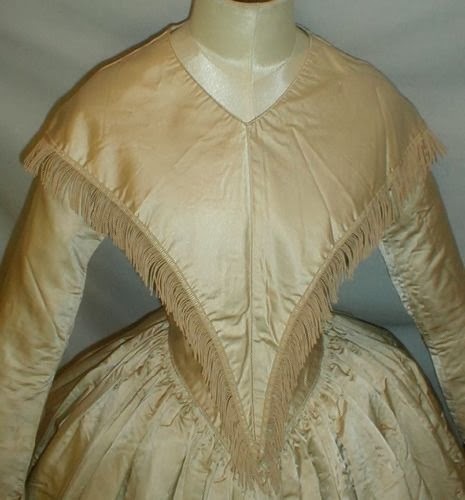 The other fabric on the top is satin. Strips of red satin appliqued with a lovely serpentine pattern go front the waist at the front to the waist on the back. 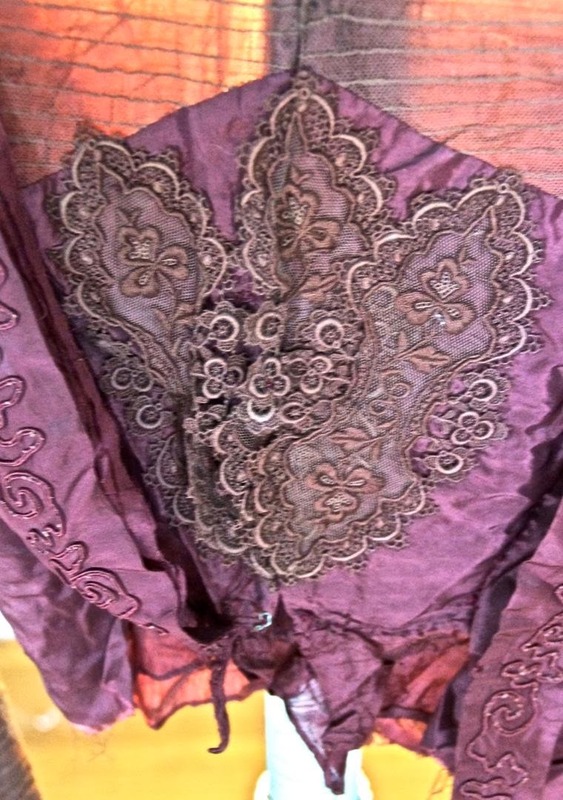 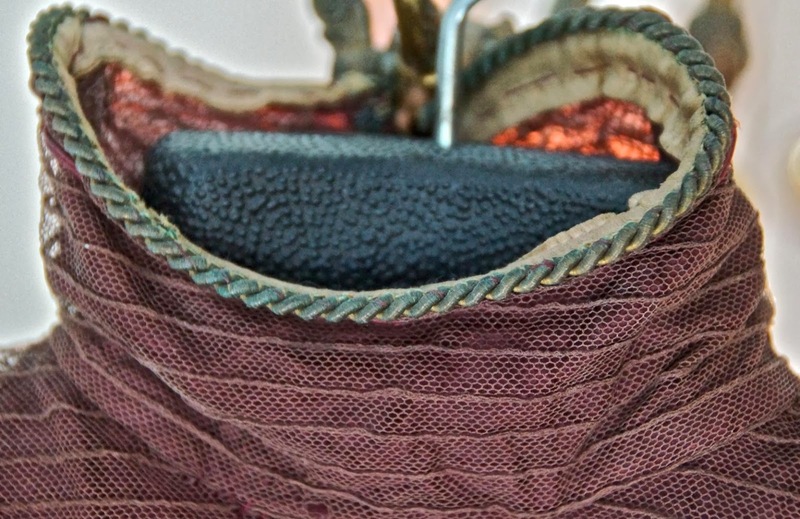 There is a detached belt (25" with hook and eye fasteners) in the same satin with the serpentine overlaid pattern. 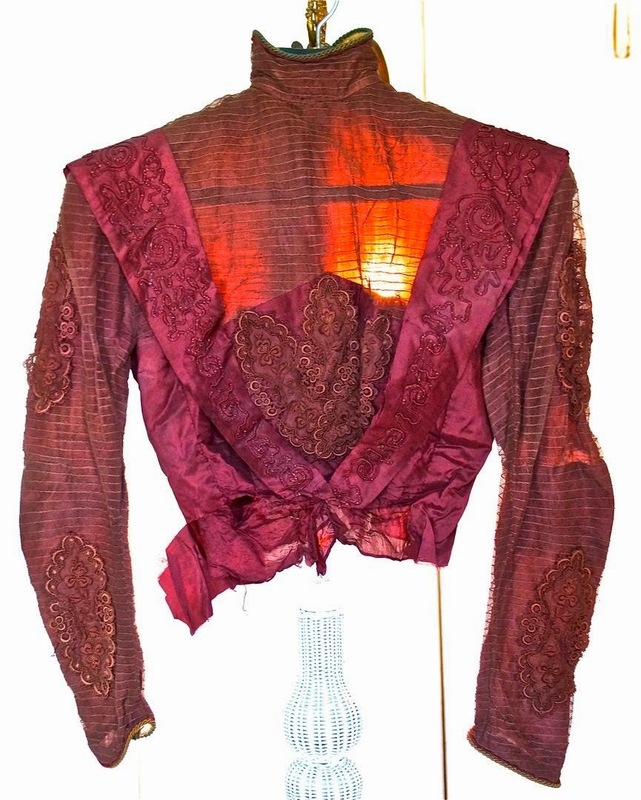 The full skirt is made of the same dark red satin and there are four 16'' inch panels with the serpentine pattern on the top of the skirt. 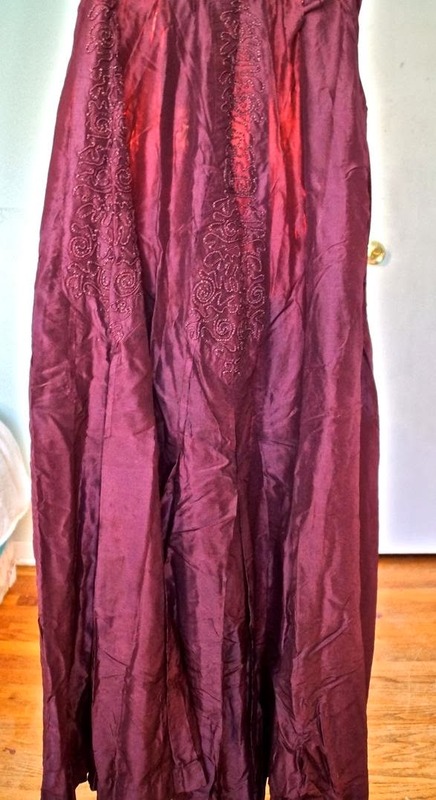 Measurements: 41" from the waistband to the bottom of the hem; 22" waist; 34" bust. 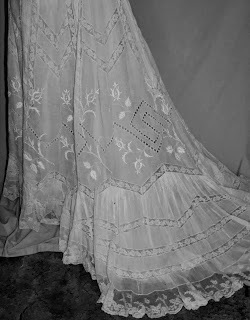 Condition: this dress is too fragile to wear; it's only suitable for display; as a pattern, or for salvaged remnants. There is considerable damage around the waist and directly below it, and some damage around the waist of the top. 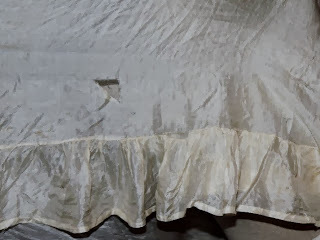 The plain satin has a significant number of splits. 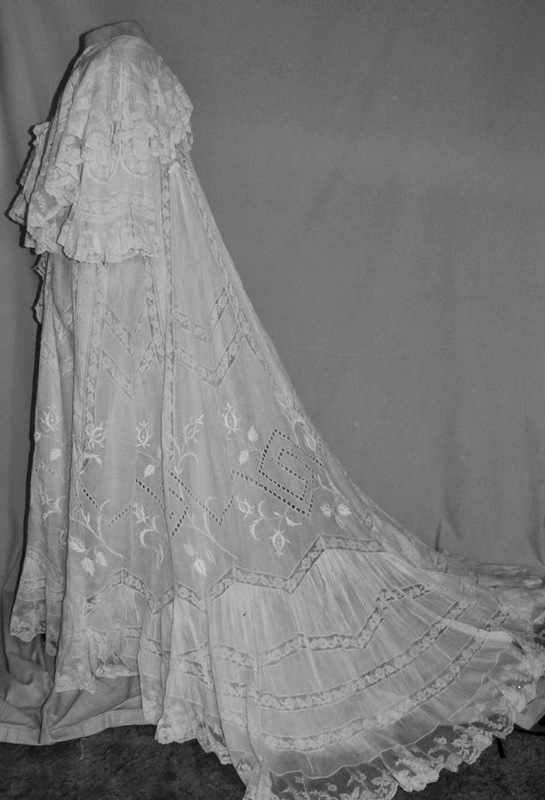 For display purposes, the gown can easily be arranged to conceal the slits in the satin or the skirt can be reworked. 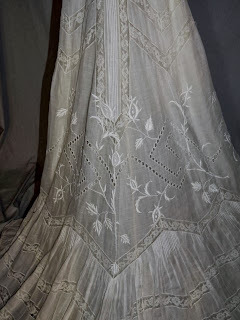 It has dainty pleats at the bottom of the skirt. 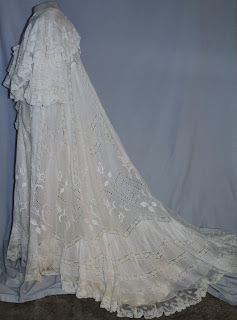 It has been in storage since it was worn originally, so there is almost no fading. It's a beautiful design with excellent workmanship. 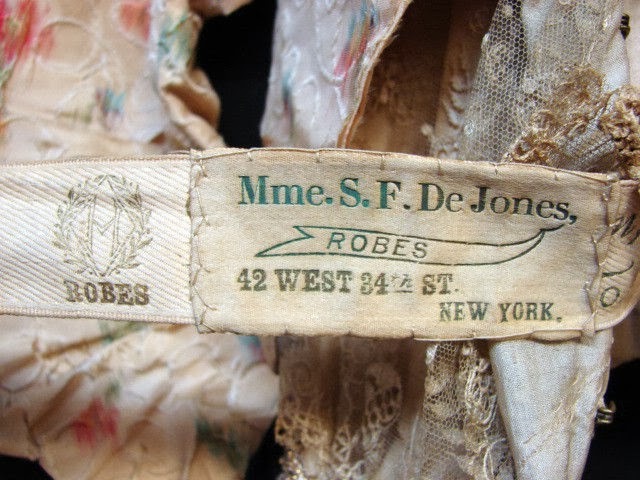 Every treasure from the past tells a unique story about times gone by, enrich your life by adding one today! 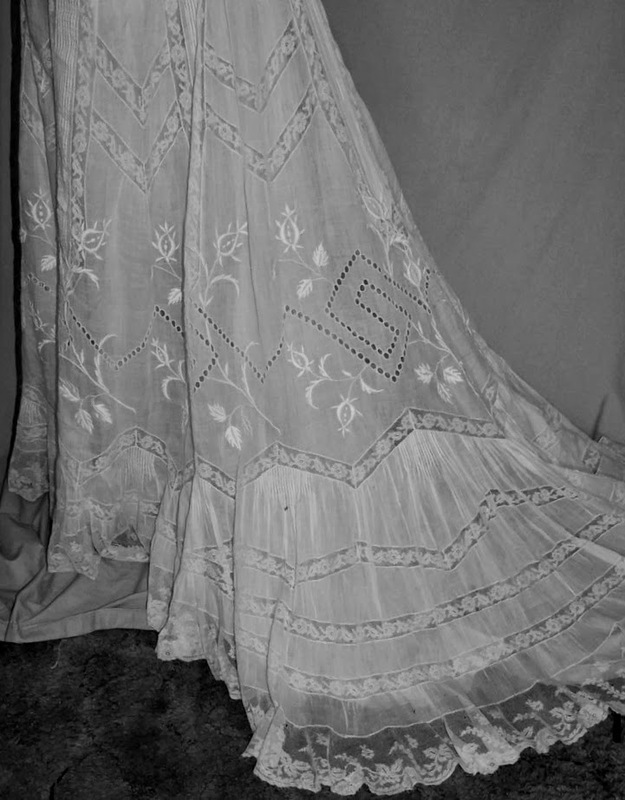 supersized images for a better of the condition. 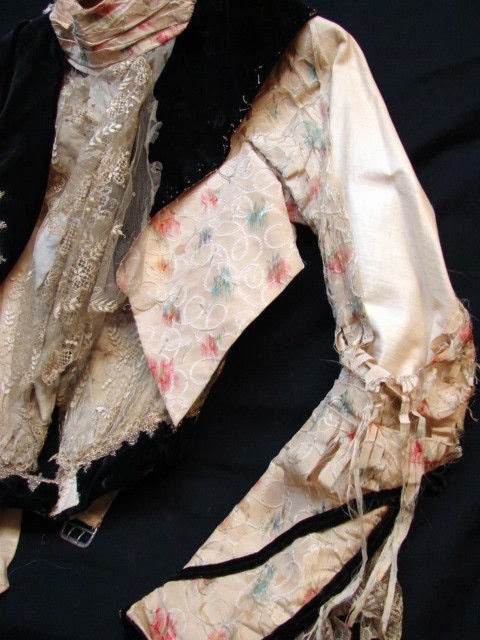 Since we sell antiques and collectibles, please keep in mind that by nature, they often have flaws. 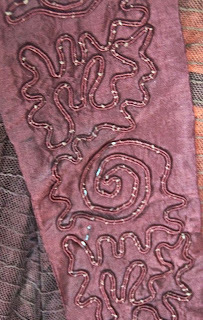 We make every effort to accurately describe our items, however if something remains unclear, please ask prior to bidding or buying. 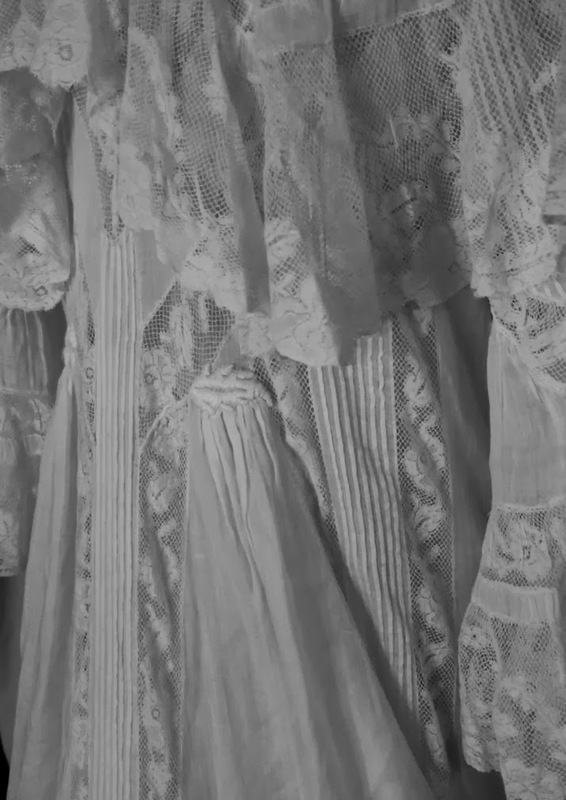 Thank you for looking, please back often! 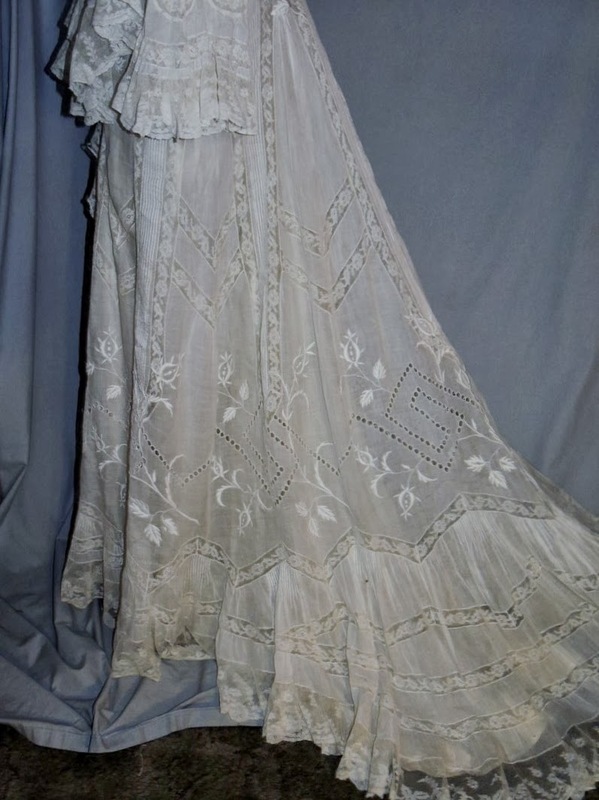 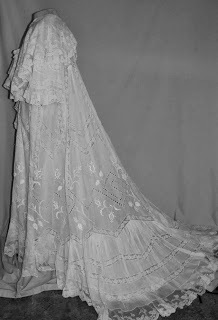 So, this is very much 1900's (about 1907) and I would be shocked if this had ever been a wedding dress.